Over 2,000 mourners at the funeral of Morgan Barnard were told that he will be buried with the crest of St Patrick's Academy on his heart. Father Aidan McCann said the special gesture was because the 17-year-old student loved his friends and teachers at the school and they loved him. 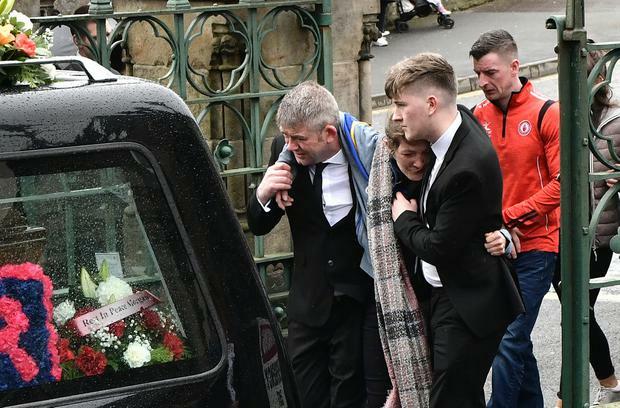 As heavy rain fell outside St Patrick's Church in Dungannon during 10am Requiem Mass, tears flowed freely inside as Morgan's family and friends mourned the loss of the young man who, the priest said, will always be remembered for the smile on his face. Young Morgan, from Springdale, in the Co Tyrone town, was one of three teenagers who tragically lost their lives in a crush while queuing for a St Patrick's night disco. Archbishop Eamon Martin, head of the Catholic Church in Ireland, also remembered the other two victims of the March 17 tragedy - Lauren Bullock (17) and Connor Currie (16) - during a short address at the start of the 70 minute service. Referring to "a valley of tears", he told the congregation that "the shocking events of Sunday remind us that life is very fragile". There were heart breaking scenes outside before the Mass when Morgan's mother Maria who, weighed down with her grief, had to be helped inside the chapel. Morgan's cousin Elliot Barnard, said a Prayer of the Faithful, through tears telling him he would always be his best friend - and "No matter where he is, I'll love him forever." Throughout the service, in a church that was packed to capacity, with scores of young people lining the aisles, sobbing could be heard as mourners young and old, struggled to deal with their sorrow. By Lauren Harte Ireland and Ulster rugby captain Rory Best has said he is "incredibly saddened" by the death of the principal of his former school. By Brett Campbell A 14-year-old girl has been charged over a stabbing in Lurgan that left another female teenager badly injured.